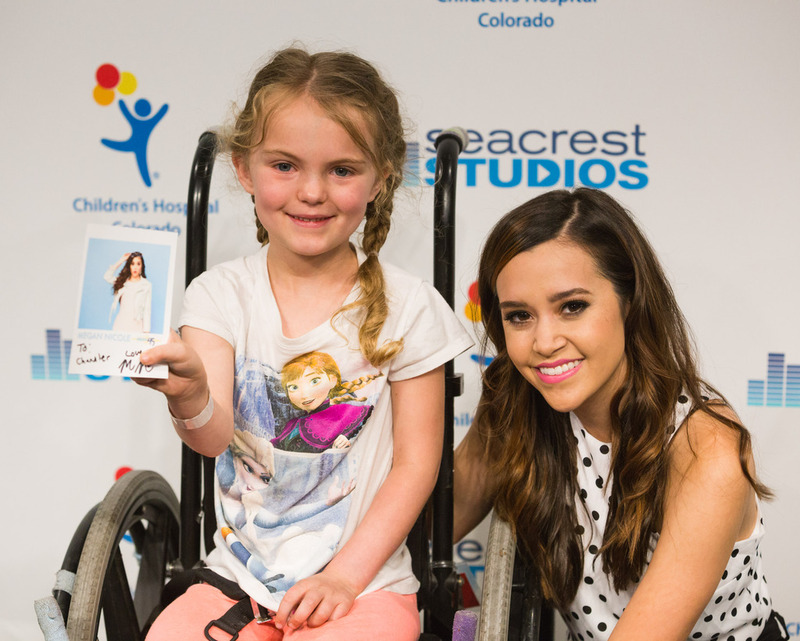 Recap written by Seacrest Studios Intern, Miranda McHodgkins Photos by Chris Coleman ------ Seacrest Studios at Children’s Hospital Colorado got a special visit from the multi-talented singer/ songwriter/actress/model, Megan Nicole, during her 2016 tour stop in Denver, CO. Megan hung out with patients, performed two songs, played games, signed autographs, and posed for pictures. Lots of kids were eager to ask questions, so the interview began right away with Maya asking, “what is your favorite TV show?” Megan pondered the question for a few seconds as she explained she goes through “Netflix binges.” She then decided on ‘Bob’s Burger’s, which is her all-time favorite show. “I just love the whole family. It’s hilarious and Tina Belcher is one of my favorite characters,” said Megan. Raja asked, “If you could enter a food eating contest, what food would you eat?” Megan quickly replied with cheese pizza as her answer. Fun fact though, Megan didn’t like pizza until she was 12-years-old! Abby asked if there was a backstory to Megan’s popular song, ‘Mascara.’ Megan said there was…she wasn’t in a very good relationship and decided that she was done crying over the guy and wasn’t going to waste her energy on him. After that she came up with the line ‘I’m not going to waste my mascara on you.’ “I just hope that people are able to listen to it and can feel empowered and know that they shouldn’t let anyone else bring them down,” said Megan. This made Raja curious if all her songs have backstories and Megan said, yes they do! “A lot of them I write from personal experiences or friends experiences and I also pull inspiration from the world around me.” Megan thinks it’s a fun process to express herself through song writing. Another song that patients asked about was ‘Summer Forever.’ Megan laughed because she had actually written the song in December when it was cold; she wanted to have a fun song that captured what summer time meant to her, which is being carefree and hanging out with friends. Megan’s attempt at Backwards Forward had her laughing as she attempted to say “blue sushi” backwards. When Megan’s backwards phrase was reversed, it sounded more like “grandma’s sushi” than “blue sushi,” filling the studio with laughter. Some other fun facts the we learned about Megan: she is a huge Star Wars fan and Chewbacca is her favorite character. Her favorite activity to do in the snow is tubing. And her favorite ride at Disney Land is Splash Mountain. After asking her tons of questions, the studio was ready to hear Megan sing. She launched into her tune, ‘Mascara,’ the studio full of fans sang along. Megan was kind enough to sing an encore and decided to play ‘Summer Forever,’ again being joined by the studio audience. Before Megan signed autographs and took pictures with everyone she wanted to share this advice: “Whatever it is you’re passionate about, love and, enjoy—work hard at it and don’t give up. That’s something I’ve learned along the way.” Then she thanked everyone for having her in the studio. It was so fun having Megan in the studio and we hope she visits again when she’s in Colorado!